I saw this tag on Charlotte's lovely blog, Makeup by Candlelight, and although I haven't actually been tagged I thought the questions sounded interesting - so here you have my rather rambling answers to the I Love Make-Up Tag! 1. When did you begin loving makeup? I remember "borrowing" my Mum's make-up when I was about five or six - if I was awake before her at weekends, I'd creep into the bathroom and give myself a bit of a makeover, which generally involved lipstick everywhere and a huge amount of mess and ruined make-up. Sorry Mum! I started wearing make-up myself probably when I was about 12 or 13 - just eyeliner really. I started wearing a proper "face" for sixth form when I was 16, and my love began properly in my second year of University. 2. How do you feel without makeup? Mostly, fine - if I'm not leaving the house, I tend to put make-up on more as a routine (I like my routines!) than because I feel bad without it per se. I'm perfectly happy to not bother, though, on a lazy day. I'm fine nipping to the shop without doing my face although if I'm actually going anywhere I'll tend to at least put on some foundation and do my eyebrows or my face looks weird! 3. What do you like about makeup? I like the ability to be creative and change the focus - I love playing with eyeshadow in particular, and have recently been wearing lipstick a bit more, too. Make-up is different for everyone but I like the fact that you can do pretty much anything with it - and of course, it's nice to look at, too! The Body Shop Tea Tree Pore Minimiser: I actually don't have a tube of this currently as I'm trying to use up some other primers, but I have to say this is probably the best primer I've ever used in terms of hiding my pores, mattifying my skin and feeling like it's good for my skin at the same time, and I will repurchase it eventually. Soap & Glory Thick & Fast Mascara: Again, I'm not currently using this (although I do have a tube in my stash, unopened) but it is the best mascara I've ever used; my lashes are long as it is, so what I really look for in a mascara is something to darken them and thicken them up, which is exactly what this does, to perfection for me! W7 12-Hour HD Foundation*: I'm only about halfway through my first bottle of this foundation but I really, really like it - it's a perfect match for my skintone, goes on matte giving a great coverage, and lasts really well which is often a problem for me. I'll definitely repurchase once I've finished the bottle I was sent, although I happily use other foundations and I definitely wouldn't say I'll never buy anything else - because I will! So, those are my answers to the I Love Make-Up Tag! I'm tagging Laura, Marie, Jess and Ebony to answer the questions, too. If I haven't tagged you but you'd like to answer the questions then please do feel free - the more the merrier! 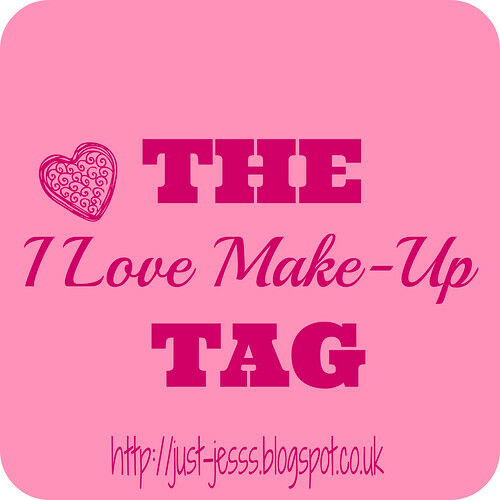 Have you completed the I Love Make-Up Tag? Link me to your answers in the comments, if you have! Do you have any Holy Grail make-up products, or are you like me and love trying new things too much to commit like that! ?